We began the current herd in 1996, with various mixed-breed (mostly dairy-cross) cows and heifers, as well as some supposedly mostly-Angus heifers we bought from a couple of cattle sales, which we bred to an Angus Bull we named Albert. From the start we regularly weighed all the animals, culling those which performed poorly, or whose calves did not do well. 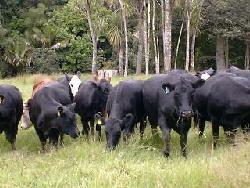 Most of these pictured (at left) are offspring of that first bull. He was a very bulky animal, quite small in stature, but weighed around 730kg. He left us with several very nice heifers of moderate size and reasonable milking ability and with a larger bull (Virago Bertrand 01) across those heifers, we have produced some great calves. From the beginning we decided that Angus would be our preferred breed. They do well on this sort of country, often having to forage for feed, without losing body condition. We prefer the "traditional" Angus frame, reasonably short-legged (who eats the legs?) and bulky. Recent trends in Angus breeding have led to animals which have approached the look of many of the larger framed "exotic" breeds of cattle, but if we'd wanted those sorts of animals, we'd have chosen a different breed.